In 1971, Mary married Bert Lee Craft, Jr., an engineer who had moved from Hattiesburg, MS to work for Kimberly-Clark in Childersburg, Talladega Co., AL.2 Unfortunately, Mary's second husband died less than three years after they were married. Mary was 67 years old. She was one of those colorful characters that brings a smile just by mentioning her name. At 99, Mary Craft passed away this past week, but the memories of her and the role she played in Talladega civic and historical affairs will linger for a long time to come. Craft believed in being involved. Whether it was historical preservation, Landmarks, Heritage Hall or as a volunteer with the Red Door Kitchen, you would find her at the heart of activities. She was the kind of citizen a town is lucky to have - one who sees what it can be and works to get it there. She will be missed by all who knew her, and Talladega will have a void that won't soon be filled. Mrs. B. L. (Mary Hodnett) Craft and Betty Welsh Farmer, "James Hodnett Family History" 8 typewritten pages, n.d. Biography* � Toppy was born in Tallapoosa Co., AL and he spent his early childhood on the family land there. His father then moved the family to Alexander City, AL and there Toppy married Charlotte Walls in September 1941. Obituary* 30 Jul 2009� Funeral service for Mr. John Wilson “Toppy” Hodnett, age 96, of Alexander City, will be Saturday, August 1, 2009 at 2:00 p.m. at the Chapel of Radney Funeral Home. Dr. Belon Friday and Randy Anderson will officiate. Burial will follow in the Hillview Memorial Park. The family will receive friends on Saturday from 1:00 p.m. until service time at Radney Funeral Home. He was preceded in death by his parents; wife of 67 years, Charlotte W. Hodnett; sisters, Mary Craft, Pauline Nix and Lela Mae Drake; and brothers, Brock Hodnett and Gaines Hodnett. In lieu of flowers, memorial contributions may be given to Children’s Harbor, One Our Children’s Highway, Children’s Harbor, Alabama 35010. E-mail written Jul 2005 - Jul 2009 to Lew Griffin from Rodney L. Dean, e-mail address. Anniston-Calhoun County Public Library, Randolph County, Alabama Birth Register 1896-1905, Anniston, AL Annie Calhoun Book Shop, 1991.
p. 169 has 11 Nov 1900. I have three degrees, the B. of Arts, Master of Education, and Specialist in Ed. Administration. Left to right, back row: Coral Lee Carlisle, Mary Emma Carlisle, Artimisha (Motley) Carlisle, Paul Richard Carlisle, being held by his father Washington Homer Carlisle. 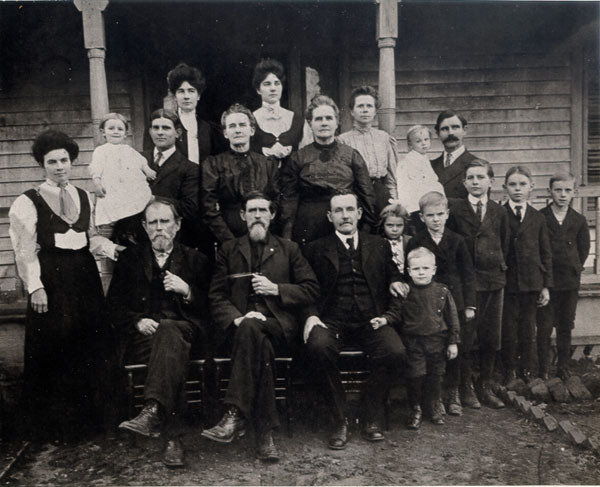 The seven children on the right side of the photo all belong to Washington Homer. Correspondence from Dwight L. Carlisle to Lew Griffin. Father* Leon W. Alston Jr.